We provide all sorts of eavestrough repairing services throughout Brampton to make sure that your gutters are working properly. May it be a problem due to failing joints or a leakage caused by improper installation, our experts will provide an affordable service in the shortest possible time. We have been providing our services in Brampton for more than ten years and have managed to earn the status of the most reputed company for eavestrough repair services. Our every employee enjoys WSIB coverage and we have full liability insurance. We own the best team of highly trained and friendly technicians striving for excellence in their work. However, the most common problem is the seam leakage which is caused by the failure of the sealing compound of seams. Seams can be repaired by mending the joints between respective gutter sections. Seam repair also includes the restoration of gutter corners and joints. Seam repair is the most efficient method to solve all sorts of leakage related problems such as excessive water damage, flooding or moisture accumulation in walls or foundations of building. Our technicians are highly experienced in all sorts of gutter repairing and restoration problems. 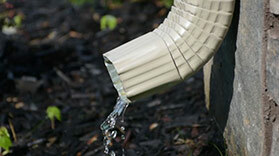 Gutter maintenance is as important as any other home maintenance process. Regular gutter maintenance and routine inspection will not only increase the efficiency of drainage but also the lifespan of gutters. However, if you ignore small problems in your gutter system, they will turn into bigger and costlier problems sooner or later. Sagging of gutters is the most common problem left untreated by majority of people. It leads to many bigger problems like loosening of joints in the longer run. The experts from NICK’S Window Cleaning are highly trained in catering sagging and other similar problems caused by timely usage. Gutters should be inspected at least twice a year. We provide regular inspection and maintenance services to make sure that your gutters are working perfectly. Gutters of large residential settlements or commercial facilities face many problems especially in severe weather and hence require regular repairing. A common problem is the addition of weight on the system due to falling of leaves in autumn. Moreover, the temperature fluctuations may cause greater damage to these gutters as compared to normal house gutters. Our experts are well versed in cleaning and repairing gutters of large commercial properties. We provide frequent inspection and restoration services to such facilities throughout Brampton. Feel free to contact us, so that we may guide you to select the best services needed for your commercial gutters. Customer satisfaction is our topmost priority. Our technicians work in an extremely safe manner and do not leave behind debris or any sort of mess caused by work. We respect not only our customers but also their valuable properties. We strive to build long-term relations with our customers. We also provide a free of cost estimate of repairing work, before you hire us for the service. For any sort of guidance, feel free to contact us. Gutter and downspout is an important part of a property and a small negligence in its maintenance can lead to many severe problems like moisture accumulation in walls and foundations. Many people try to save their money and solve their problems by themselves without consulting any industry professional. If you try to repair your gutters by yourself without any proper knowledge, you will probably end up creating more problems. So, hire a professional and spend a few bucks if you want to save more in the longer run. Gutter inspection or repair should not be taken lightly as it is a very dangerous task for someone with no knowledge in this area. That is why it should only be given to experienced industry professionals who have the right equipment and resources for it. To some people, climbing high ladders may seem a thrilling adventure but without proper equipment, both you and your property are at a severe risk. We provide all sorts of eavestrough repair and cleaning services. We will solve all your problems, from locating failures in downspout outlets to mending failing spikes and broken ferrules, we do everything quickly and efficiently. We are a highly reputed eavestrough repairing service with over ten years of experience in Brampton. 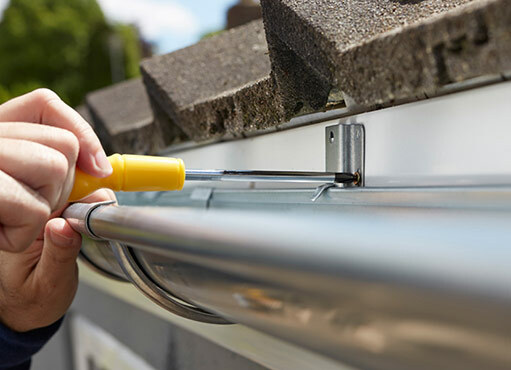 We have all the resources required for repair, maintenance and cleaning services of gutter. We have a highly experienced and trained team of friendly professionals who strive for excellence in their work. We are the best in town!